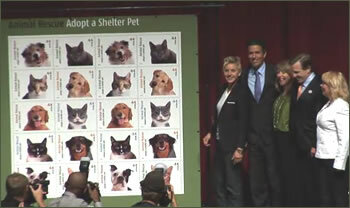 Joining The Humane Society of the United States’ Wayne Pacelle and representatives from the United States Postal Service, American Humane Association, and Petfinder.com on stage at Hollywood’s Academy of Television Arts & Sciences for a press conference, Ellen DeGeneres unveiled the new 44 cent stamps featuring the adorable faces of five dogs and five cats, all of whom had been adopted from animal shelters and rescue groups. Mr. Pacelle made the following observation: About 8 million dogs and cats are funneled through shelters every year. They come to shelters for a variety of purposes, they have been found on the streets, or people relinquish them to shelters. There is this stigma that is attached to animals at shelters – that there is something wrong with them, that they are defective, or have some behavioral problem, or some physical problem. Those of us who have adopted animals from shelters know that is false. Contrasting with dogs who are sold from puppy mills, shelter dogs are properly socialized with tremendous attention from shelter workers. The animals at shelters are actually the best socialized animals. They get excellent veterinary care. The dogs and cats know what is going on. They know that someone has come to rescue them. They are enormously grateful to their new owners for the rest of their lives. What he sees as one of the most tragic things is that only 20% of dogs in people’s homes come from shelters. Four out of five dogs are coming from other sources. If just a small percentage of people who are getting dogs, this year or next year, got them from shelters rather than from a puppy mill or pet store, then we would solve this problem. Maggie (the rescue shelter dog), Julie and Murry of the DogBlog: A Dog’s Eye View and the BestDogBlog.com agree whole heartedly. 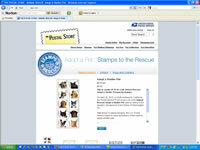 We encourage you to buy some Adopt a Shelter Pet Commemorative Stamps and remember there is a dog or cat waiting for your love at a rescue shelter. Please remember them when you need a friend.